He was said to have received the blessing of the national leader of the ruling All Progressives Congress, APC, Asiwaju Bola Ahmed Tinubu; yesterday, Dr. Olusegun Abraham chances of clinching the Ondo State gubernatorial ticket for the forthcoming election got a major boost as two prominent co-aspirants to stepped down for him. Mr Akinnola Akinyinka (Ondo Central) and Dr Paul Akintelure(Ondo South) announced that they had dropped out of the race to back Abraham to pick the ticket in tomorrow’s primary, The Nation Newspaper reports this morning. Akintelure, the running mate to Mr Rotimi Akeredolu in the 2012 governorship race, said: “People have asked me why I stepped down to support Dr. Abraham as our next governor of Ondo State, and all of the time, I give them a simple response, Ondo State must work”. “I’ve said it countless times that the reason why the party leadership, myself, some of the other aspirants and a majority of the delegates embrace Abraham is because of the fact that he practically understands the politics of economy, the thing that Ondo needs. A lot of people are neck deep into the politics of power in Ondo State, but, what we need is someone who understands the politics of economy, and in Abraham, we have that person”. “Abraham is tested, he is competent, he also has the courage to lift Ondo from this doldrum to Eldorado. It is evident in his antecedent and expertise, and for the interest of Ondo and her own, I support him to be the next Governor of Ondo State”. Akinnola said: “when I took the decision to join this race, I had a clear vision and desire in my mind for Ondo state and her people. A desire of transformative change that will make Ondo State become a state where things work, where the lives of the people are truly transformed for good. I was prepared to use my experience in business, infrastructure and expertise as a professional engineer to make this happen. Today, as I step down to throw my weight behind the candidacy of Olusegun Abraham, an astute man with a similar vision, I am confident, I have every confidence, that this vision to make Ondo truly transformed is intact”. He added: “We all know that Abraham is an accomplished technocrat, a very successful businessman and a practising engineer who also has an understanding of the capital market, he has the abundant exposure and core expertise to make transformation happen in Ondo State. I am happy to back him and I promise to give maximum support to ensure victory on Saturday. According to field reports, other aspirants who have joined the Abraham camp include: Adesida-Abiodun Aderin, Awodeyi-Akinsehinwa Akintola (Apata), and Akinrinsola Odumayo (Kabonti). Abraham promised to work with the aspirants and in line with the progressive manifesto of the party, to bring what he termed as “complete transformation” of the state. 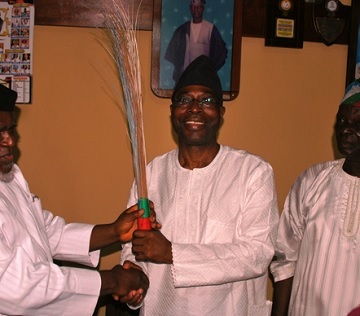 He said:”You can see the array of aspirants gunning to govern Ondo, professionals in their own rights. Dr. Paul is a successful medical practitioner with vested interests in other developmental fields, while Hon. Akinnola is a professional engineer who understands infrastructural development. With this set of people, our state, under the progressive government is set to undergo complete transformation, economically, in terms of infrastructure and as touching the welfare of the people”. “As I’ve always said, it is time to embrace discerment and discard sentimemts, and then, employ experience, expertise, and exposure to lift Ondo out of squalor into buoyancy. Ondo is too blessed to be wallowing in this pool of poverty, owing salaries, accruing debts, and all. The plan is simple, revive our economy in practical terms, using what we have to become what we deserve to be”.